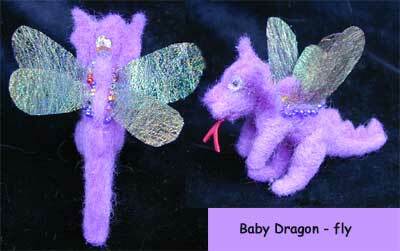 Anyone familiar with my work will know for me this chap is tiny, at just 2.25 inches ( 60mm) he is much smaller than most of my work but years back I made a tiny bear and rabbit so I though I would try something tiny that was needle felted and what better than one of my favourite creatures a baby dragon fly - only this one is a little different since Draco is a baby dragon wearing dragonfly type wings as he isn't old enough to have proper dragon ones and while he might be tiny but he still took over a day to to create. Draco isn't jointed since he is only a youngster but he has already started to collect a little dragons hoard and a decent set of spines have begun to form down his back. He has a tiny open mouth with an ultrasuede forked tongue and small bead eyes.